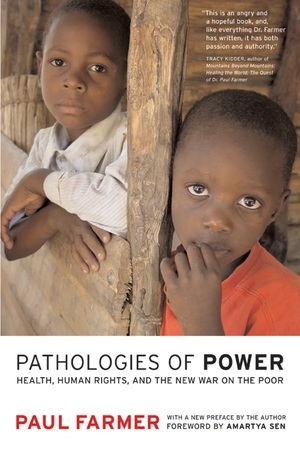 Pathologies of Power uses harrowing stories of life—and death—in extreme situations to interrogate our understanding of human rights. Paul Farmer, a physician and anthropologist with twenty years of experience working in Haiti, Peru, and Russia, argues that promoting the social and economic rights of the world’s poor is the most important human rights struggle of our times. With passionate eyewitness accounts from the prisons of Russia and the beleaguered villages of Haiti and Chiapas, this book links the lived experiences of individual victims to a broader analysis of structural violence. Farmer challenges conventional thinking within human rights circles and exposes the relationships between political and economic injustice, on one hand, and the suffering and illness of the powerless, on the other. Farmer shows that the same social forces that give rise to epidemic diseases such as HIV and tuberculosis also sculpt risk for human rights violations. He illustrates the ways that racism and gender inequality in the United States are embodied as disease and death. Yet this book is far from a hopeless inventory of abuse. Farmer’s disturbing examples are linked to a guarded optimism that new medical and social technologies will develop in tandem with a more informed sense of social justice. Otherwise, he concludes, we will be guilty of managing social inequality rather than addressing structural violence. Farmer’s urgent plea to think about human rights in the context of global public health and to consider critical issues of quality and access for the world’s poor should be of fundamental concern to a world characterized by the bizarre proximity of surfeit and suffering. Paul Farmer is Professor of Medical Anthropology at Harvard Medical School and Founding Director of Partners In Health. Among his books are Infections and Inequalities: The Modern Plagues (California, 1999), The Uses of Haiti (1994), and AIDS and Accusation: Haiti and the Geography of Blame (California, 1992). Farmer is the winner of a MacArthur Foundation "genius" award and the Margaret Mead Award for his contributions to public anthropology. He recently held the Blaise Pascal International Chair at the College de France. Amartya Sen, whose work challenges conventional market-driven economic paradigms, is the winner of the 1998 Nobel Prize in economics. He teaches at Trinity College, Cambridge University.